Malta is one of the EU’s best regulated and most tax efficient jurisdictions for cross-border aircraft finance and aviation business. This is a result of Malta’s adoption of the Cape Town Convention (CTC), the creation of dynamic aircraft and mortgage register, and a number of tax measures and incentives aimed at ensuring attractive tax results for international operators. Malta does not provide for a blanket tax exemption on aviation profits but through careful planning, tax incidence can be minimised yet allows payment of some tax which is relevant in claiming treaty benefits. Income derived from the ownership, leasing or operation of aircraft or aircraft engines is deemed to arise outside Malta irrespective of the country of registration of the aircraft and its engines. A foreign aviation company may establish tax residence in Malta in order to benefit from this rule. Its income is deemed to arise outside Malta and will only suffer Maltese tax if remitted to Malta. An aviation company already established in the Cayman Islands, for example, can transfer its effective management and control to Malta and benefit from Malta’s extensive double tax treaty network. No tax is paid in Malta unless the company decides to remit the income to Malta. Another scenario where such rule has been used is in respect of ‘end of life structures’ with Irish lessor companies receiving fixed amounts at the end of a lease after capital allowances would have been claimed in full by the lessor, thus resulting in taxable income. If such company transfers its tax residence to Malta, no tax is paid Ireland or Malta in terms of the non-remittance rule and the treaty applicable. A company that is incorporated in Malta cannot benefit from the remittance rule in view of the worldwide basis of taxation. However, income from aviation business is subject to 35% but when such profits are distributed as dividends, shareholders are credited with 6/7ths of the tax paid by the aviation company on such profits. A 5% effective tax rate therefore applies. Furthermore, in terms of any treaty drafted on the basis of the OECD Model Convention, such profits should be taxable only in the country of effective management of the enterprise, in this case Malta. The private use of an aircraft by an individual who is not resident in Malta and who is an employee or officer of an aviation company, shall not be considered as a taxable benefit. 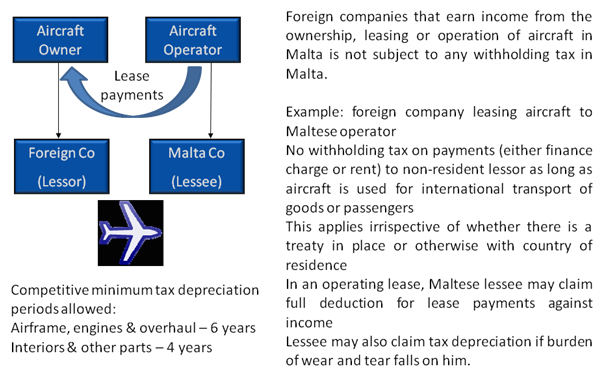 (3) No withholding tax obligations on Maltese companies operating aircraft in international transport when making lease payments to foreign lessors. No deduction is allowed for tax depreciation since these are claimed by the lessee. The VAT department issued guidelines on VAT implications of a finance lease of an aircraft. A VAT exemption applies on the purchase or leasing of aircraft used in international transport. However, aircraft not used in international transport are not covered by the exemption. The lease of such aircraft is a supply of a service which is subject to VAT with the right of deduction of input VAT by the lessor. This service is taxable according to the use of the aircraft attributed within EU airspace. In this regard, the estimated percentage portion of the lease based on the time that the aircraft is used in the airspace of the EU is calculated on the basis of an expert technical study. VAT at the standard rate of 18% is applied on the established percentage of the lease which deemed to be related to the use of the aircraft in EU airspace. The lease agreement shall not exceed a period of 60 months and the lease instalments shall be payable every month. Where after the end of the lease the lessee exercises the option to purchase the aircraft, a VAT paid certificate will be issued provided that all the VAT due has been fully paid.